In June 2014, my brother was in the middle of preparing for his final school project and I was assigned the task of helping him with the design of his presentation. Since I didn’t have PowerPoint installed at home, I decided to work with Google Slides. In an hour I had a more than a decent template ready. I was surprised at how little effort it took, and naturally felt pretty pleased with myself. Presentation software, whether Powerpoint or Keynote, is often a source of great frustration. Most people have developed a trained eye to detect when a presentation is not aesthetically pleasing to the eye, but unless you are a trained designer, most people do not have the skills or knowledge to produce an ideal presentation. This is a pain point all too common because design is crucial and can make all the difference between landing a client or getting that first seed investment for your startup. Following the experience with my brother, I knew that the speed coupled with the experience I had with the given presentation software, gave me a great advantage. Which led me to the following thought: Could I offer free templates and make money? While I certainly wasn’t the first one to think about it, I wondered if there was a niche I could exploit. Free templates of low quality, with just two slide variants and designs resembling something from the 90s. High quality, but costly templates, with professional design, hundreds of different slides and countless customization options. I realized that there was a niche for free templates with a decent design, without the need to spend long hours to actually produce them. 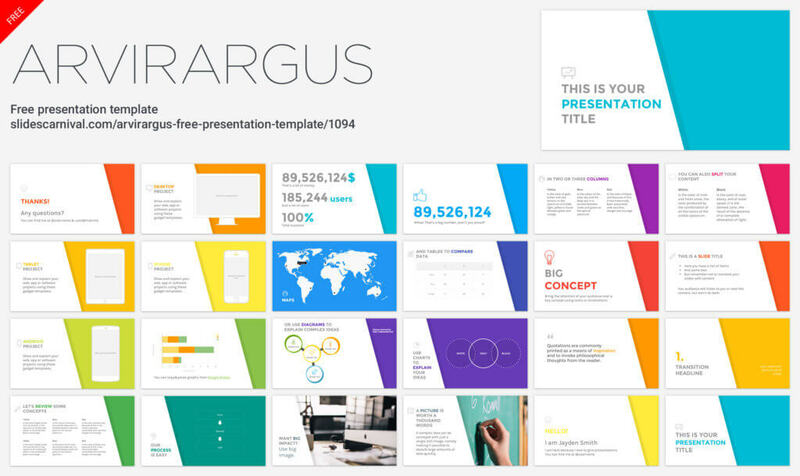 In addition, the available options for Google Slides were non-existent, beyond the four templates offered by the application itself. In the summer of 2014, taking advantage of some of the free time l had, I went ahead with my ambitious idea. I chose the name SlidesCarnival from hundreds of alternatives a web-based word combining tool had suggested. I then created a basic presentation with the most common slide types, which I chose from SlideShare. I also designed five templates not to start with an empty website. It took me a day to design a website with WordPress. I was determined not to have the site in English and therefore it took me a lot longer to write all the content for the home page as well as the instructions and the descriptions of the initial templates. I then created social media pages on Facebook, Twitter, Google+ and Pinterest. All in all I dedicated a few weeks of my time during the sunny July of 2014. In September I sent an email announcing it to family and friends and posted it on my social networks. In addition, I decided to spend about 50€ in ads on Linkedin. The truth is, I didn’t devote much time to the launching SlidesCarnival and it could have as easily ended up with the rest of my side projects: in the cemetery of ideas that never materialized. Quite honestly, I didn’t have much faith that this one would work any better than my mane other projects that never saw the light of day. My lovely friends gave the project a promising start by sharing on social networks and even doing reviews on their blogs (I love you and you know it!). The second push came when SlidesCarnival was hunted on ProductHunt, which turned out to be huge – at the time I didn’t even know they existed. As a result, my site started ranking well on Google for some interesting keywords, and the numbers have been growing ever since. When I set up SlidesCarnival I imagined hordes of executives to use my presentations. To my surprise, my real audience turned out to be teachers and students of the Google Education Program in the United States. That’s why most of my traffic peaks take place during the school year. Since launching SlidesCarnival, I’ve been adding 1-2 templates per month. The first income I generated was invested into translating the site into Portuguese and Japanese (because 127 million Japanese). As soon as I started having visitors it became clear that the first WordPress template I was using would end up being a hindrance, so I switched to another one that significantly improved the website’s loading time. Automated responses to emails and comments as well as social networks. Created a list of subscribers. Implemented SEO adjustments to better position for certain keywords. SlidesCarnival is still a fun project, which allows me to learn and experiment with things like monetization, optimization, SEO, analytics, social network management, UX and visual design. I’m currently thinking about other ways to grow the project and take advantage of the audience beyond the monthly batch of new templates. An ebook and/or an online course in presentation design. Do something useful with the list of subscribers (6,000 in less than a year and rising). It’s the first question many people ask me when I mention the income I generate from the site. However, I think this would be crazy, because I like my day job. A lot. Designing a couple of templates a month is fun, doing it every single day would be torture. The business model can easily copied. It’s certainly not safe from competition. Any two design students with more free time than I have can exceed the quantity and quality of my content in just a few months. Clones have already started to emerge. If the Google algorithm suddenly decides that the content on my website isn’t good, I’m dead. If Google decides to stop betting on its document editing suite or changes the policy of what can be done, I’m dead. For now, my current part-time role running SlidesCarnival is working well and provides me with something to fall back on during times when I have less freelance work. SlidesCarnival is here to stay and I will continue to put my heart into it. For now though, I’m not quitting my day job. Jimena Catalina Gayo is the founder of SlidesCarnival.